New PADI Open Water Diver Devaan, Congrats! 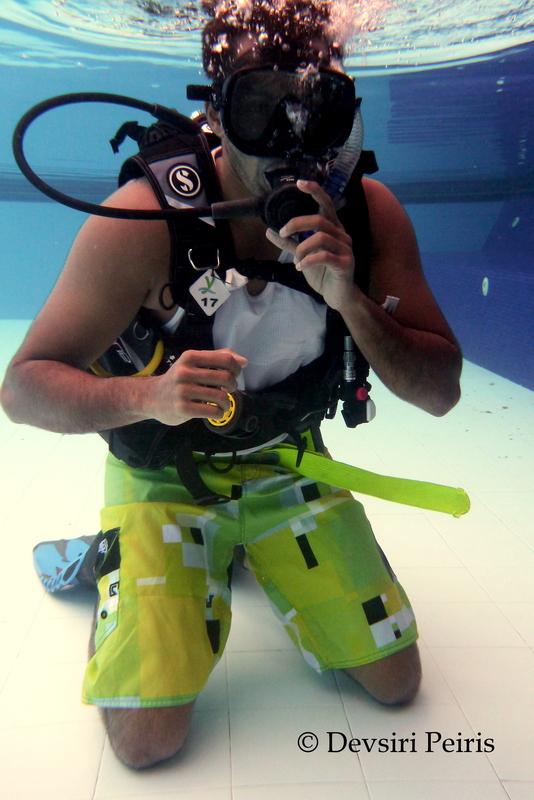 After going through some dive theory in the dry class room, Devaan takes his first breath underwater.. The pool training covers 24 skills which each student masters before they head out to sea. Basically learning and practicing dive skills in the pool. 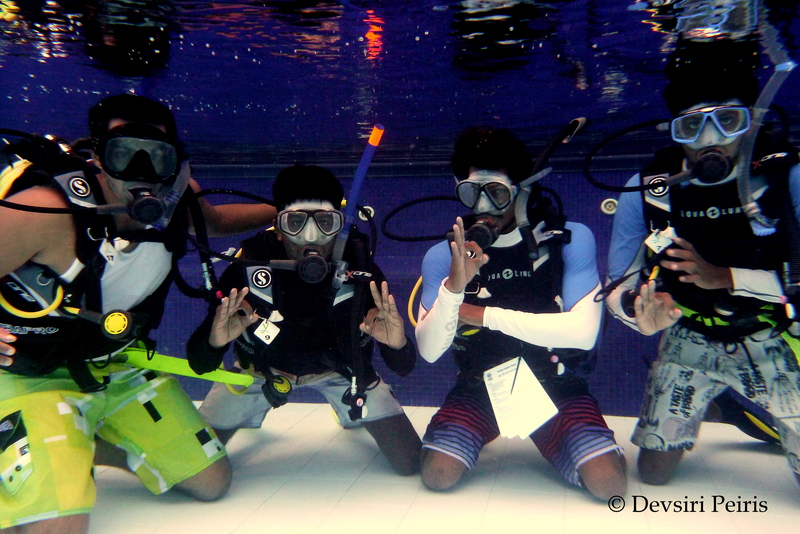 Devaan and Upeksha completing the pool training with the two very helpful Dive Master trainees (DMT’s) Tamba and Nuwan. Devaan and DMT’s Tamba and Nuwan on their way to Pigeon Island for Devaan’s first Open Water Dive. Instructor Roy, Dive Master Sampath and a few of the Dive center staff of Ypsylon Dive Center also join us in the boat, on their way to do a reef clean up around Pigeon Island. PADI Instructor Deco (Devsiri), Devaan and two DMT’s on Pigeon Island just about to take the plunge. Pigeon Island National Park consists of two small islands off the east coast north of Trincomalee . The island gets its name from Blue Rock Pigeon, a native endangered bird who lives within the rocks in these islands. The islands were declared a sanctuary in 1963 for the purpose of protecting these birds. 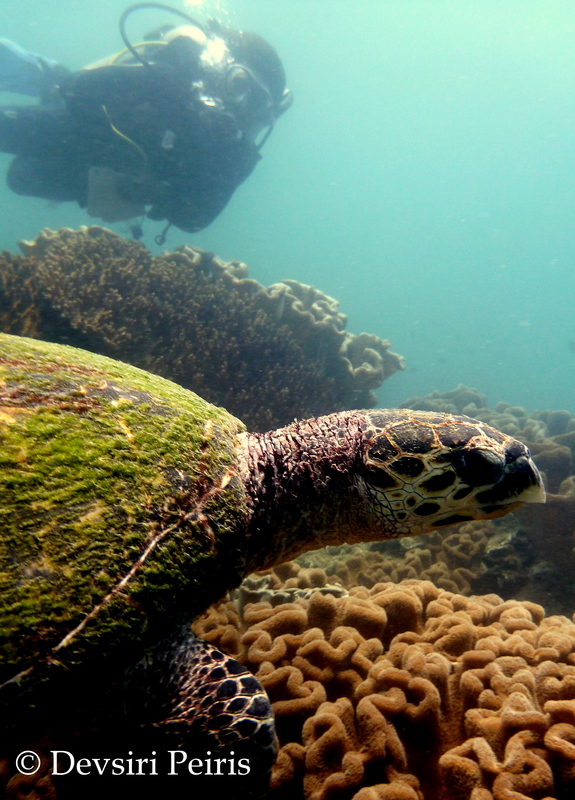 In 2003 this area was upgraded to the status of a National Park and the boundaries were extended to include coral reef around them. 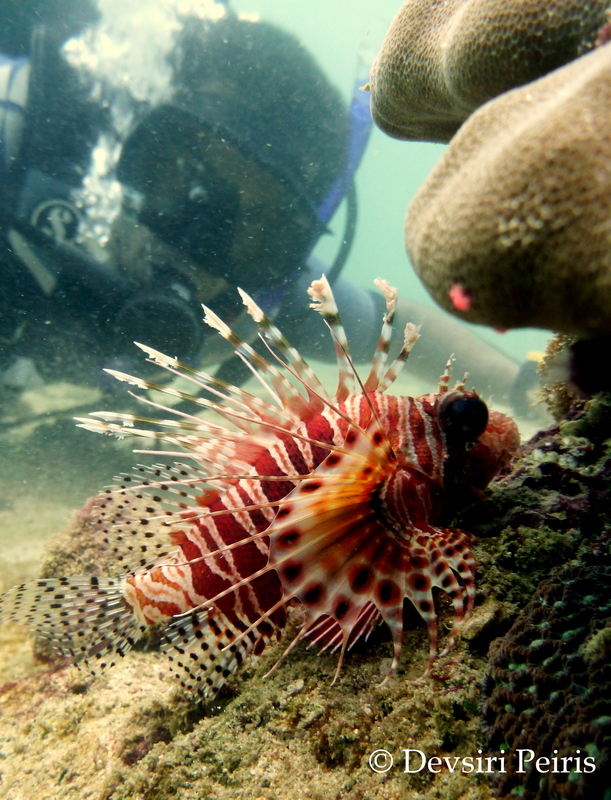 Beautiful but also poisonous Lion Fish! 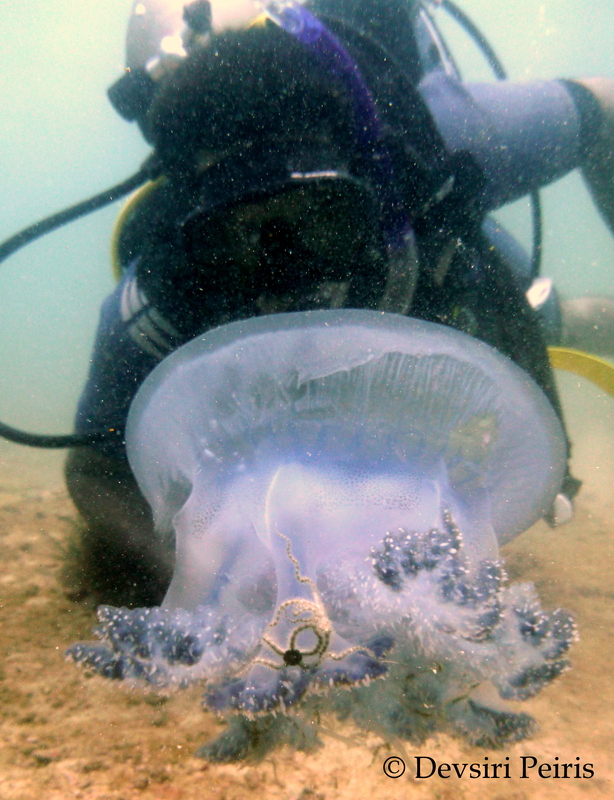 Like almost all marine creatures they too are non aggressive and as long as you don’t try to touch them or harass them, you are safe from their poisonous sting. 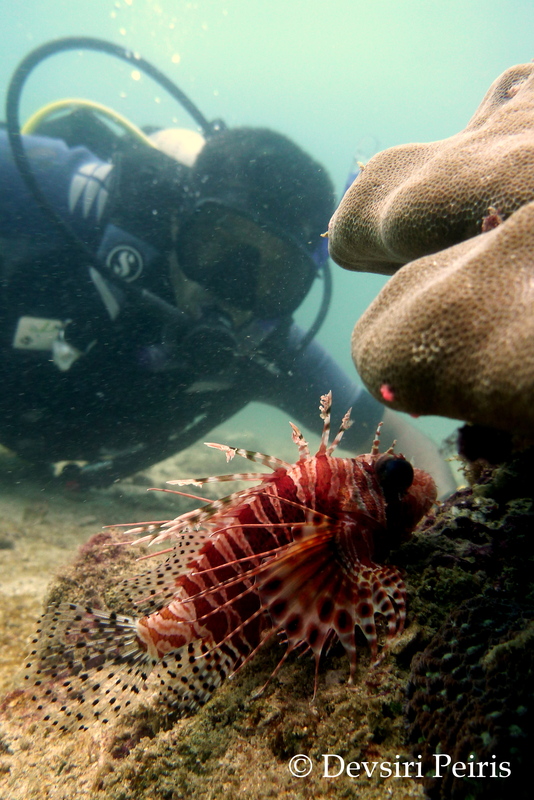 As divers or snorkelers restrain from touching anything in the ocean , not only to avoid getting stung but also to protect the environment and be responsible divers. Nemo, (Anemone Fish) and his home the anemone. Devaan inspecting a big Jelly fish, this type is absolutely harmless to humans since they don’t have their stingers, unlike some of the other jelly fish which can give a nasty sting which could be painful or irritable. Also known as the Pharaoh Cuttlefish, makes you feel hungry! But no. I prefer to see them alive and swimming rather than on my plate! Remember this is a Marine Sanctuary! No touching! 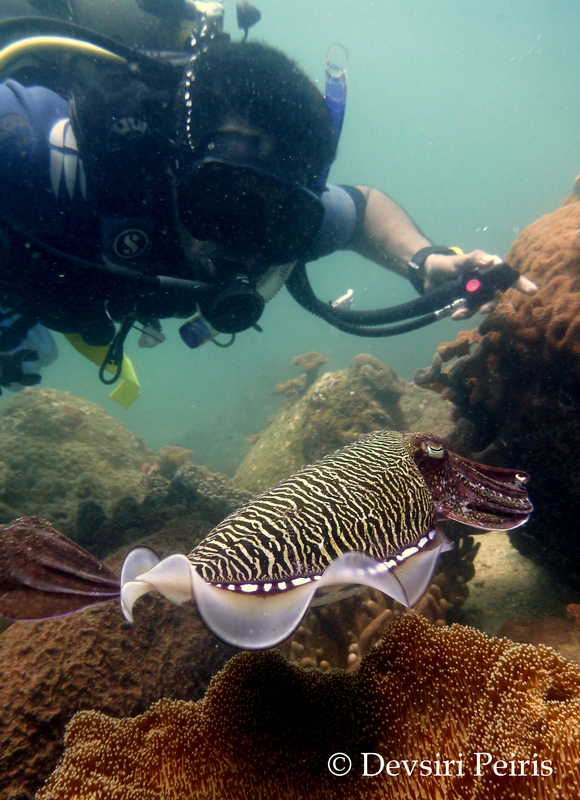 Cuttlefish can change their colors and also the texture of their body instantly. Always reminds me of the Pharaoh in the story of Moses (book of Exodus), how he kept changing his mind, LOL. God’s creation is so amazing, it declares the Glory of God! Shelly the resident turtle at “Eric’s Point” comes to greet the new PADI Open Water diver and welcome him to the amazing Underwater World! Shelly gets really close and almost knocks the camera out of my hand… she is very friendly and always a delightful sight! 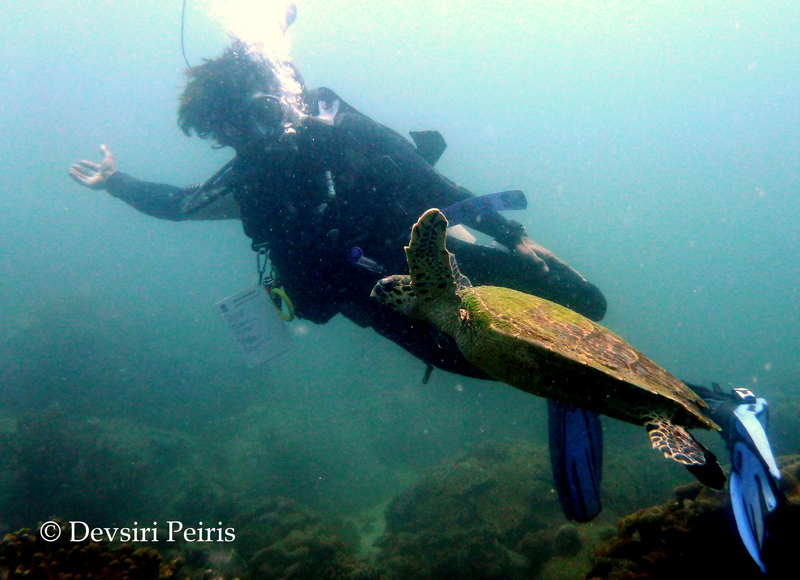 What an exciting dive course with a very good dive student! congrats and well done Devaan!! !